The Software architecture is completely modular. It comprises of entities which operate in a layered environment, with physical, data link and network layers, to support the communication between AN-RAX and LE. Most of the entities use an FSM based approach. The coding is done in C language. The entire software runs on the ARC card. The other processor based card in the system is the RTC card. The software for this card is reused from the RAX product. Maintaining modularity, the architecture has been conceived as comprising of two major modules: the V5 Module and the AN Module. This comprises of entities/processes which handle the V5 protocol towards the Local Exchange(LE). It consists of the processes for PSTN protocol (PSTNT), CONTROL protocol (CPT), Bearer Channel Connection (BCC), LINK CONTROL protocol (LCP), and PROTECTION protocol (PPT). ii) System Management /Access Initialisation Task (AIT) It consists of the system level general management and the layer 3 management for the V5 protocols. This comprises of entities/processes which handle the product related features. It implements strategies for providing fail safe services to the ANRAX subscribers. The user interface is provided through an RS232 interface. The MMI provides interface for the user to configure the V5 interface and perform the maintenance functions on subscriber ports and V5 links. This process handles the RTC (tester card) communication protocols and the port testing. This process handles the interrupts and subscriber events reported by SPC/ISP card from the line side. Also handles the ring cadence and metering pulse feeding. Manages the data link entity. It also acts as a message parser and distributor for ANRAX system for message received on V5 links and IPCP links. The functionality regarding the management of V5 links is shared with protection protocol entity. It implements the data link layer functionality for both : V5 protocol and Inter processor communication within ANRAX. It handles the error correction and ensures reliable communication over physical channels. 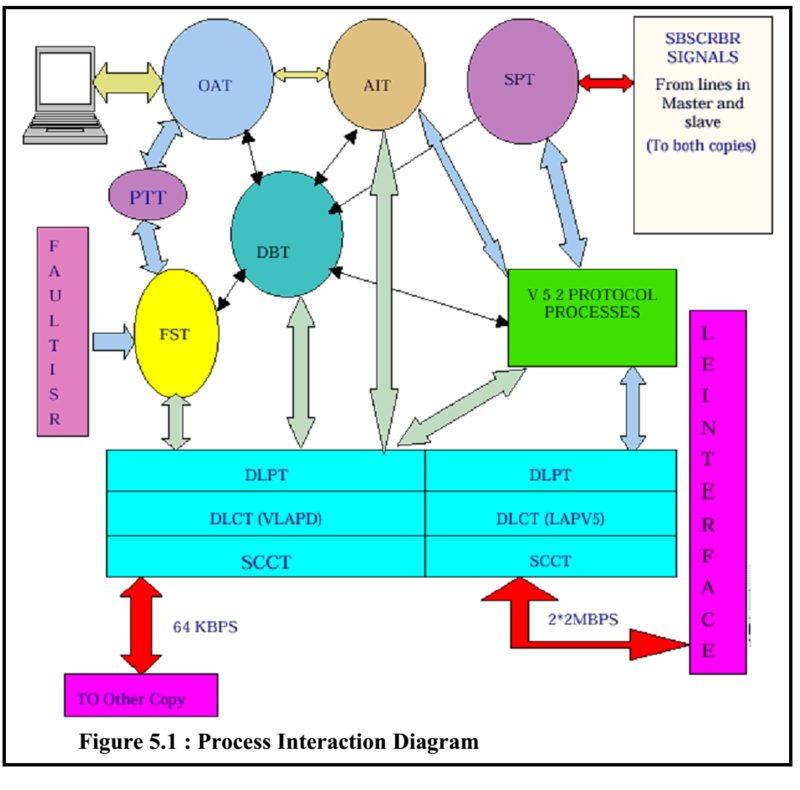 Driver/Serial Communication Control Task (SCCT) It is the interface between Data Link Entity and Communication channel. The operating System is real time, based upon Xinu Operating System (Xinu Real Time OS). As we know, V5 protocol is `message based’, i.e., any information between LE and AN is exchanged through messages available in different protocols. The list of messages available in different protocols is given below. Message flow between AN and LE is explained in sec. 5.4.7.1 & 5.4.7.2 with the help of examples. Further, message flows in different call scenario is given at the end of this chapter. On receiving a call request from the network for a particular AN port, LE feeds call routing tone to calling subscriber and proceed to get a bearer channel for this call by sending an ALLOCATION message to AN and starts a timer. After getting an ALLOCATION COMPLETE message from AN, LE sends on ESTABLISH message to AN with cadenced ringing parameter to connect the ring to user port and starts a timer. AN sends ESTABLISH ACK message and call enter into ringing phase. In case AN subscriber has caller-id feature in which directory number of calling subscriber is to be sent to user’s equipment, LE shall send ESTABLISH message to AN without cadenced ringing parameter. LE shall send the digits in-band and thereafter send a SIGNAL message with Cadenced Ringing to AN to connect ring to user port. Call enters into conversation phase when answer is received from the AN subscriber, answer should be communicated across V5 interface by sending SIGNAL (Off Hook) message to the other end. Various subscriber features can be initiated by the subscriber by doing Hook Switch Flash when the call is in the conversation phase. If the release of the call is initiated from LE, parking tone should be fed to AN subscriber, parking tone timer shall be run at LE and disconnection from AN subscriber be awaited. AN subscriber disconnects before the expiry of parking tone timer, this indication comes in the form of SIGNAL (On Hook) message across V5 interface. Call clearing is started by sending DEALLOCATION message and on getting DEALLOCATION COMPLETE, PSTN protocol is cleared by DISCONNECTION / DISCONNECTION COMPLETE message. AN on detecting an origination from user port should send ESTABLISH message to LE. LE shall send ESTABLISH ACK message in response, gets a bearer channel by ALLOCATION/ALLOCATION COMPLETE and connect dial tone to the channel. When answer is received from PSTN subscriber, call will enter into conversation phase. For AN originated calls from subscribers with home metering facility, metering pulses shall be reported to AN in the form of SIGNAL (Meter Pulse) message over the V5 interface.